It sure would be easier just to hate Bradley Cooper. He’s a giant Hollywood superstar attached to another stunning starlet each week, he’s cut his teeth in the past by collaborating with absurdist comedy troupe Stella and taking part in the brilliant ensemble of Wet Hot American Summer, he was a major player for arguably the strongest mainstream comedy of the last fifteen years in The Hangover (and had the integrity to hold out on the role of Phil until it was more than a one-note “womanizer”), he’s growing a major career as a cinematic leading man, and he’s, like, a gazillion times more handsome than me. Or you. Sorry to break that to you. Yet despite all these reasons we should all be insanely jealous of Bradley Cooper, so help me I find something just so damn likable about him. It’s this likability which propels the sci-fi-ish, action-ish thriller Limitless over giant roadblocks which might have held the movie back with anyone else attached. Cooper stars as slacker writer Eddie Morra, who has a book deal and an amazing lazy streak (he still hasn’t written one word as his publishers breathe down his neck) — when his ex-brother in-law pops up with a couple of pills in hand that allow Eddie to access “100% of his brain.” Almost overnight, Eddie has turned his life around: he writes his entire book in one sitting, he learns other languages, he organizes everything in his life. The only problem is, he wants more of these pills to keep this good thing going. The thing that’s so frustrating about Limitless is that director Neil Burger (The Illusionist) has an immensely fun premise to work with, but he’s as lazy with it as Eddie before the magic pills. We see glimpses of what might have been, especially in Eddie’s first drugged interaction with his landlord’s wife, who is yelling at him about rent. As Eddie glimpses at a scrap of paper hanging out of her purse, he garners that she’s in law school, currently studying a certain subject, and he accesses his own subconscious from several years earlier of a moment in which he casually flipped through a law textbook while waiting for a friend. He works his magic on her, quickly recalling and reciting everything he read, and the two end up in bed together. This scene is a great example of what Burger could have filled the entirety of Limitless with: sharp, quick cut moments wherein we see how Eddie is using his newfound powers. Instead, each time Eddie pops a pill we’re subjected to a music video-style montage of our hero at clubs, parties, hotel rooms and other “glamorous” locales. Burger seems to forget that the pills don’t just make you “cool” and “important;” they make you extra-smart, and we’re never glimpse into how Eddie’s manufactured wisdom helps him to realize these fancy outcomes. The main crux of the tale is Eddie’s addiction to the pills, of course; it doesn’t take a mastermind to realize that soon the plot’s going to take a nasty turn when he starts to run out of them. 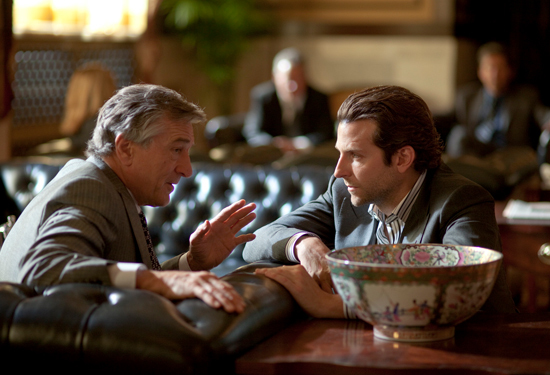 On the way to that point, auxiliary characters like Carl Van Loon (Robert De Niro), a corporate bigwig who wants to access Eddie’s thinking for his own benefit, and a Russian mobster (Andrew Howard), who also begins to covet the limited stash of Eddie’s pills, waltz in and out of the storyline. And then, of course, Eddie begins to learn that everyone who’s taken the pills dies when they stop. Which is a big downer. Limitless is carried completely and ably by Cooper — but it’s a somewhat genre-defying story that never seems to really gel outside of Eddie’s main focus (get more pills = keep being awesome). De Niro doesn’t add much to the proceedings, and it’s never completely clear what his character is asking Eddie to do — the sign on the door to Van Loon’s office might as well read “BIG BUSINESS.” Burger’s greatest mistake in Limitless‘ story is that he only gives us major plot points, hoping we won’t ask questions about anything between plot benchmarks. The tragedy is that as a viewer, one gets the idea that the action between said plot benchmarks would have been where all the fun would be. Limitless isn’t really worth paying a cent to see, but might bear a TNT viewing on a lazy Saturday afternoon — if only because that Bradley Cooper is so damn charismatic.